Remember a couple of weeks ago I shared my friend Michelle’s recipe for Mom’s Homemade Gravy? 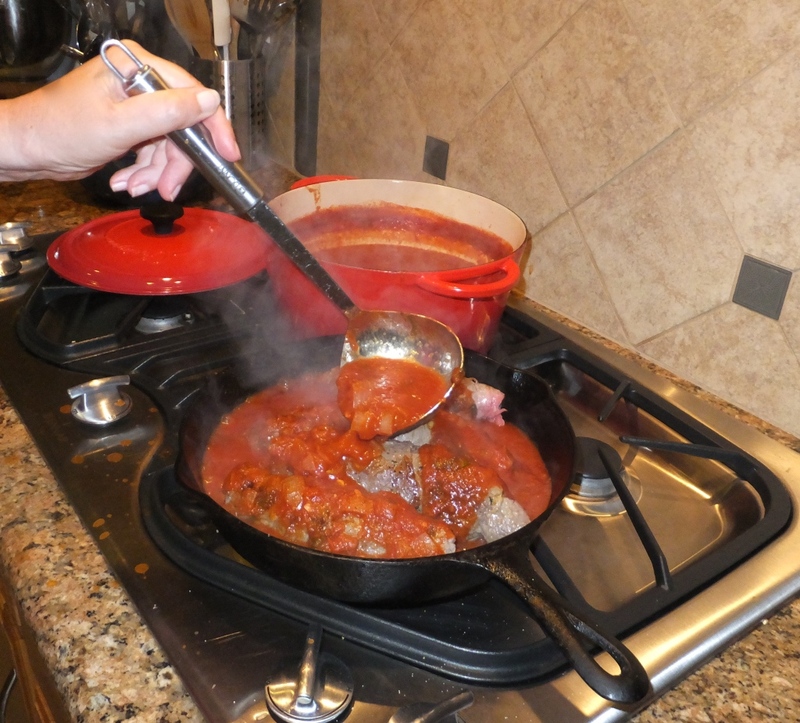 I promised to share recipes to use that delicious marinara sauce and here’s a real favorite! 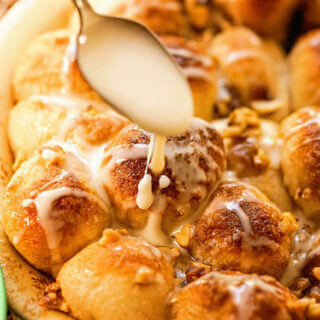 It’s a recipe I shared on my Facebook Live Feed earlier this week and I wanted to make sure you got a chance to check it out!. Thinly sliced beef is stuffed with bread crumbs, figs and herbs then slowly simmered in a bath of sauce. When I was growing up in Boston, all the women in our Italian family made gravy every Sunday morning. This was a rich tomato sauce, with meatballs, sausage, and, if we were lucky, Bracioli. Bracioli is basically a stuffed piece of beef. There are lots of recipes with many variations, but here’s how we make ours. MEAT: Buy thin round steak at the grocery store. 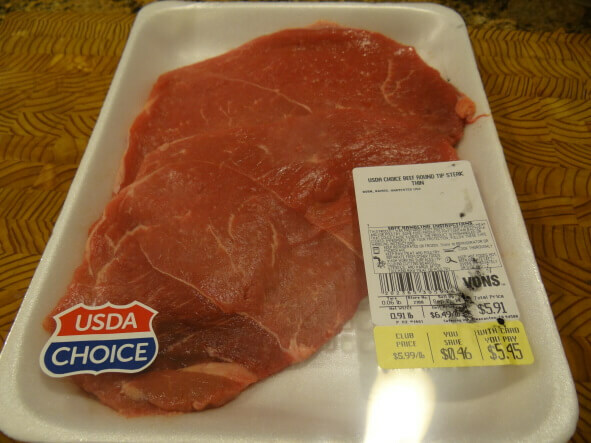 It used to be hard to find, but they now sell Carne Asada, top round cut into thin pieces. I make sure I get the package that has as little fat as possible. Take each piece out and trim off any fat. Then, put the pieces between waxed paper, and pound until they are thin and tender – not too thin or the meat will tear. Pound the meat with a mallet until it’s thin and tender. FILLING: I use freshly made breadcrumbs, my favorite are stale croissants, or some crusty bread left out for a few hours to get dry. Stick in the blender, small pieces at a time, and add parsley and fresh basil to each small batch. Pour into a bowl and add parmesan cheese, one beaten egg, salt and pepper. Add a handful of raisins, and about ¼ cup of pine nuts (optional). Moisten with a bit of olive oil or water squeezing with your hands until it all stays together. Let the egg and olive oil sit a bit on the bread before you squeeze together. Breadcrumbs, pine nuts, raisins and parmesan cheese. 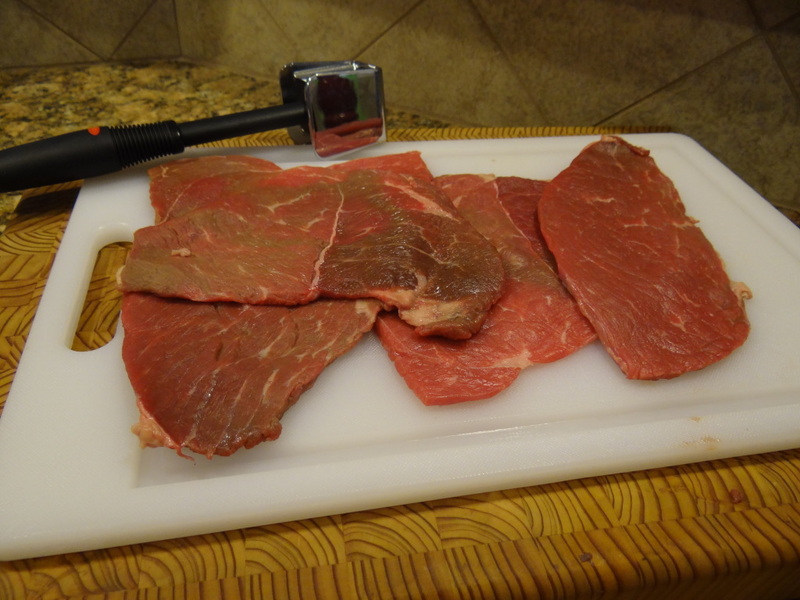 MAKING: Lay each piece of beef down on paper towels and put some of the filling in each one. 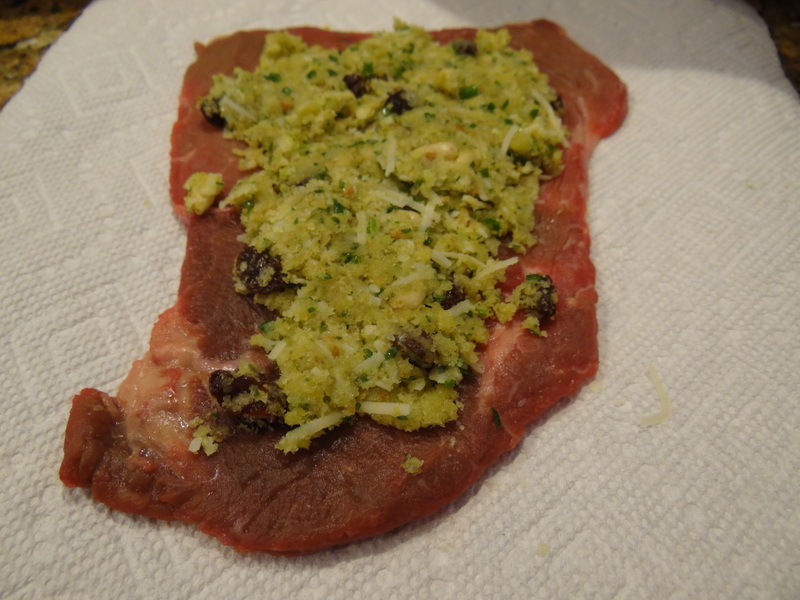 Fill the beef with the breadcrumb mixture. Don’t overfill or the filling will fall out. Roll each one up and secure with either thread or toothpicks, whichever you prefer. Roll up tightly and secure with butcher’s twine or toothpicks. Pour Marinara Sauce over the meat. Remove string or toothpicks before serving. You can cut each bracioli into rounds, or serve as is and let each person do his/her own (not quite as pretty, but easier). This is everyone’s favorite, so make sure and make lots. As I don’t make gravy every Sunday, I just make a big pot of without all the other meat. Then, we have lots of leftovers for freezing. Author, my fabulous friend Michelle! 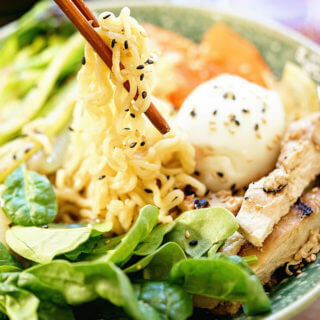 I completely agree with my buddy Michelle – this is an incredible dish. In the recipe above I used dried figs in place of raisin and I loved the flavor combination. 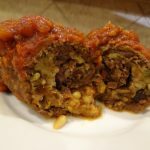 The meat is perfectly tender, the stuffing so delicious and when you bite into it the pine nuts burst in your mouth. Of course you can substitute with jarred sauce, but Michelle’s recipe for Mom’s Homemade Gravy is the perfect combination. 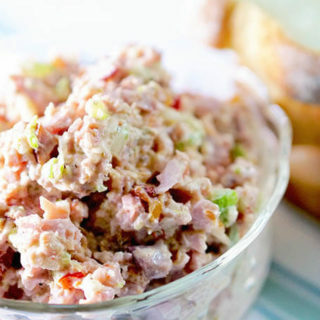 This is savory with just a touch sweet – truly amazing flavors! Bracioli is labor of love to make and completely delicious. I hope you give this a try and make it for the most special people in your life! 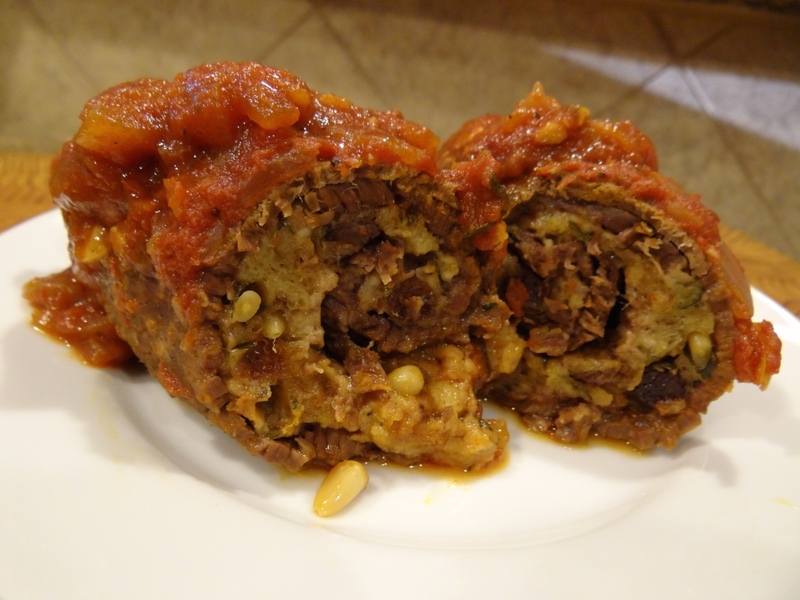 Bracioli - Stuffed Beef A labor of love to make and completely delicious. The meat melts in your mouth. The stuffing and marina sauce is a perfect combination. Author: Guest Author, Michelle T.
1/2 cup raisins or figs if you use figs, remove the stem and chop into small pieces. Begin by preparing the meat. Remove the fat. 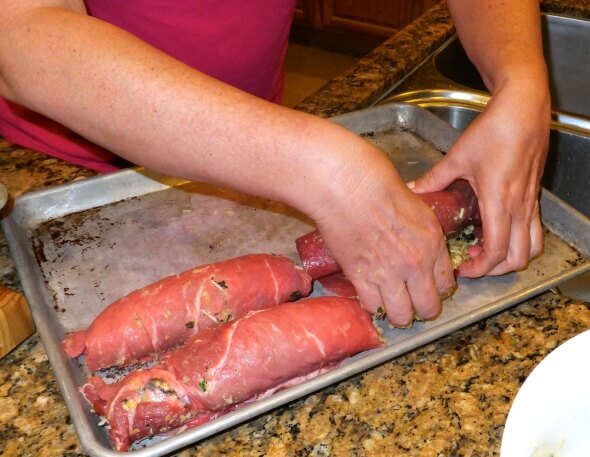 Place between wax paper and pound each slice of meat until it is thin and tender. Do not pound too thin as the meat will tear. Set the meat aside. If you are making your own breadcrumbs, do that next. 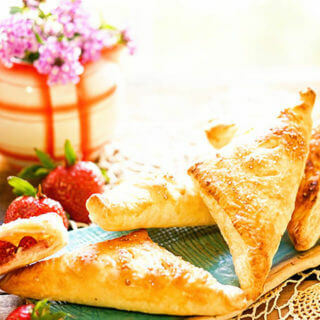 Using a food processor, tear the croissants into small pieces and add to the processor. Also add the parsley, basil. No need to chop the parsley or basil, just add them to the food processor and pulse until all of the ingredients are chopped into small pieces. Remove from the food processor and put into a bowl. 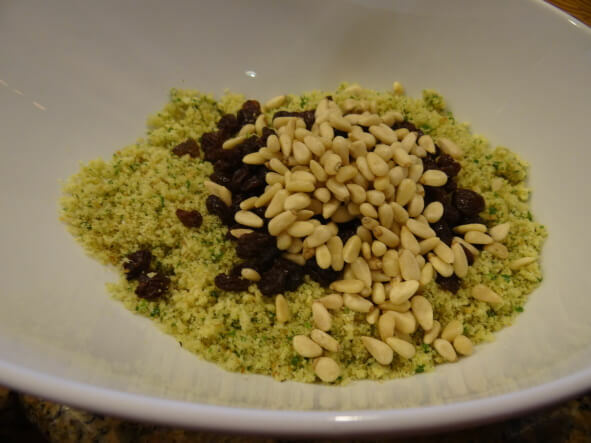 Add the Parmesan cheese, pine nuts and raisins or figs to the breadcrumbs. Season the stuffing with salt & pepper. Mix lightly. Add 2 tablespoons of olive oil and a lightly beaten egg. Allow to sit for a few minutes before mixing everything thoroughly. Lay each piece of beef down on paper towels and put some of the filling in each one. Don't overfill or the filling will fall out. Roll each one up and secure with either butchers twine or toothpicks, whichever you prefer. Saute in olive oil until lightly browned on all sides . Remove from frying pan and add to your own pot of simmering Marinara sauce. Cook for about 45 minutes until fork tender. (or pop in the oven for one hour at 300 degrees. Remove twine or toothpicks prior to serving. You can cut each bracioli into rounds, or serve as is and let each person slice his/her own (not quite as pretty, but easier). If you do not want to make your own bread crumbs substitute with 2 cups of Italian bread crumbs. 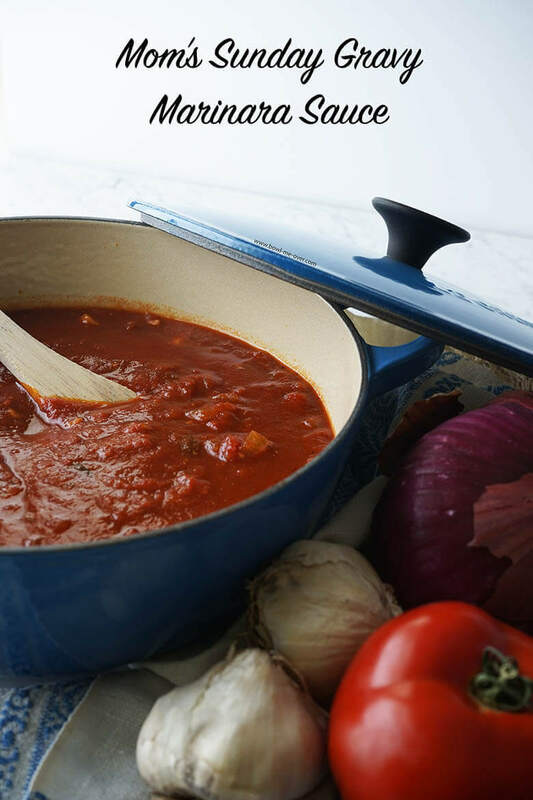 Be sure to make a double batch of Marinara Sauce! 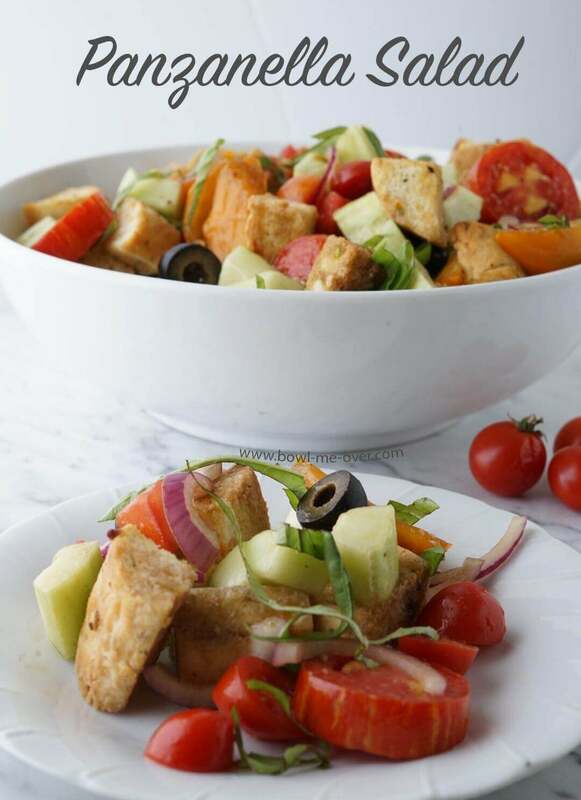 Panzanella Salad is a great summertime salad – it’s best served room temperature so it’s perfect for a barbecue! Bracioli – Beef stuffed with bread crumbs, herbs and figs, smothered in sauce and baked until tender! We had this for dinner and it was fabulous. What a treat. 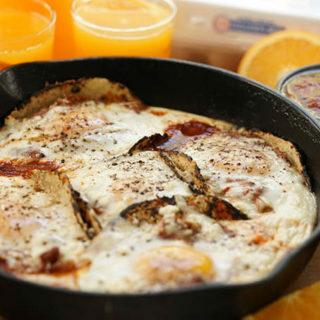 My Mom would be soo happy to see her recipe in your blog. Thanks. Now I have to make some. It’s soooo good, one of the best meals I have ever made. Thank you and thanks to your Mom for such a great recipe. My Mom and I made it together and it was a great thing to do! I have never had bracioli! 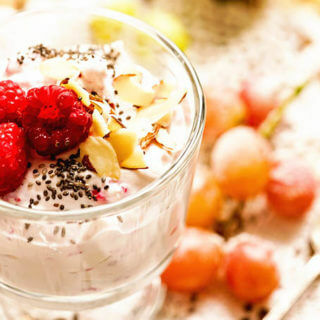 Now I have to try it, it looks delicious! Then you definitely need to try this Kristin. It’s an amazing recipe. I’m so lucky to be able to share my friend Michelle’s story. This looks fantastic. Great flavor profile. It is amazing – definitely a labor of love! I love Bracioli! It may be a little labor-intensive but so worth it in the end! I would start drooling the moment my mom told me she was making it. I have never had raisins in mine so I might have to make it again (DARN) and try your version! Darn right, haha! 🙂 I love it with figs too, it’s really an amazing dish! Thanks so much for stopping by Jennifer, enjoy! I love the comfort food feel to this recipe. I have never made beef like this before and now that I saw your video, I feel more confident to try. Wonderful Sandi! 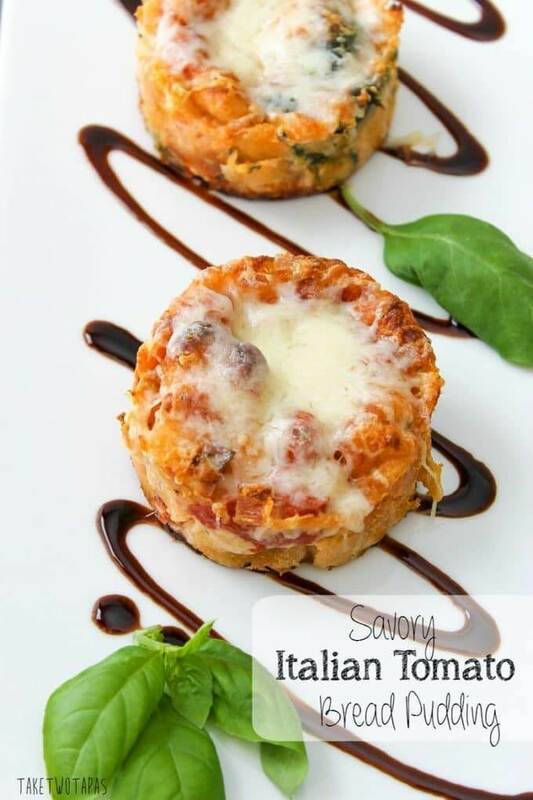 I hope you do give it a try, it is so delicious – substitute the filling w/spinach and you would be set – it is just delicious!